Do you remember the fragrances of your childhood bedroom? 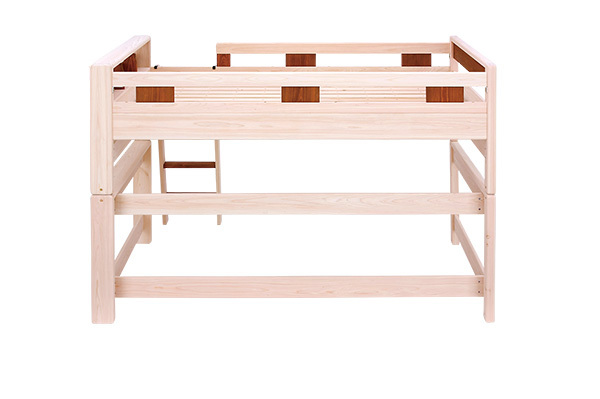 KOTOKA is the first series from ETO’s range of hinoki furniture, created using solid wood from Japanese cypress trees grown in Kyushu. 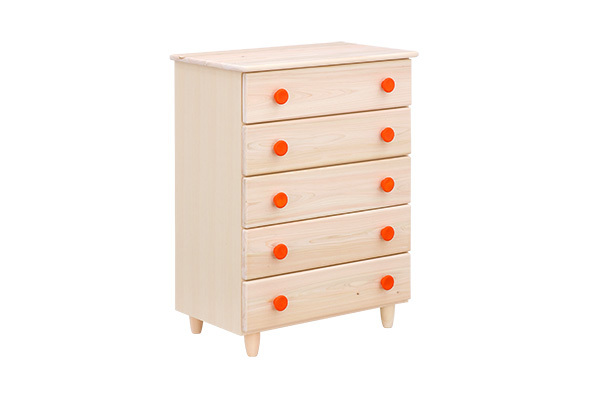 Full of childlike playfulness from the natural hues of Japanese cypress accented with orange, the series’ simple presence – similar to Scandinavian furniture – is attracting attention from overseas countries in Asia and beyond. The name KOTOKA is derived from the first letters of words forming the Japanese phrase “KOdomo no TOki no [omoide no] KAori” ([memories of] fragrances from childhood). When asked by a friend, “What kind of furniture do you recommend for a child?”, ETO’s designer struggled to give an immediate reply, prompting him to test a variety of wood types. Following a process of trial and error, he eventually settled on Japanese cypress for its gentle color and texture, and pleasant scent. The KOTOKA series is also winning praise at overseas exhibitions. We are currently working to consider the cultures and lifestyles of our overseas customers so that we can offer detailed localization of our designs for each country and region. We believe that giving shape to ideas born from discussions with our customers is another important aspect of design work. We continue to pursue new challenges with the release of the Tampare living room series and the IKI lifestyle furniture series, as the second stage of ETO’s range of hinoki furniture. The memorable fragrance of Japanese cypress. A richness of spirit through invisible design. 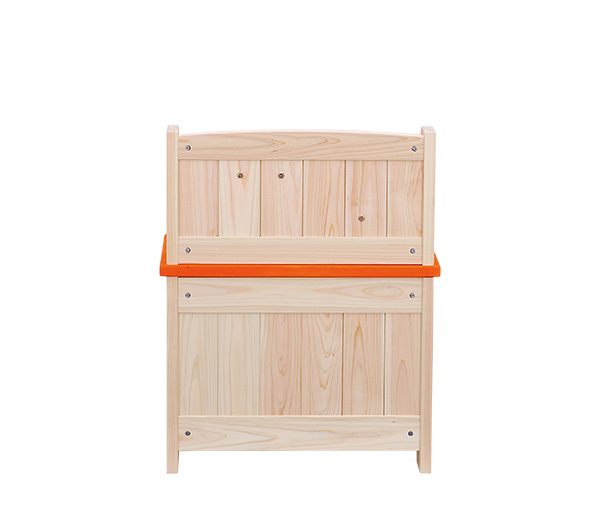 KOTOKA is a series of children’s furniture painstakingly crafted from Japanese cypress and made in Japan. 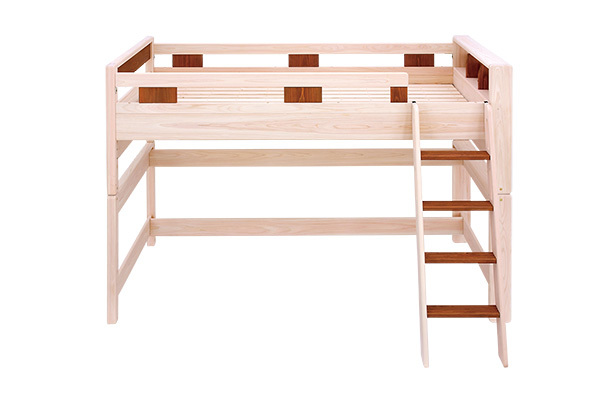 It is created through the skilled techniques of artisans in Japan’s most prominent town for furniture-making – Okawa in Fukuoka Prefecture. 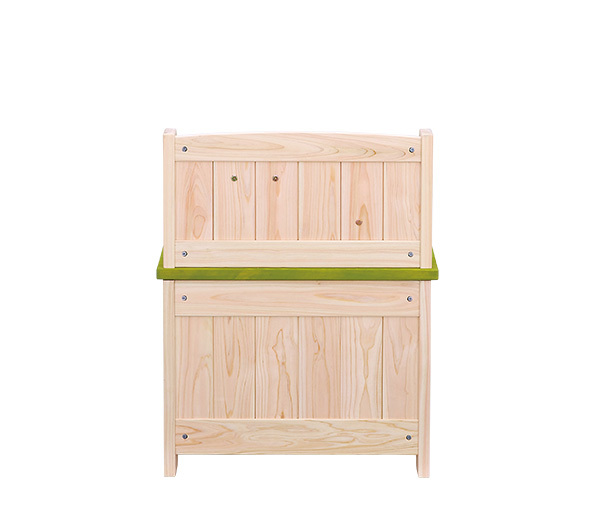 Japanese cypress makes for furniture that is profoundly enjoyable to use as your child grows, developing ever more expression to its luster and color the longer it is used. 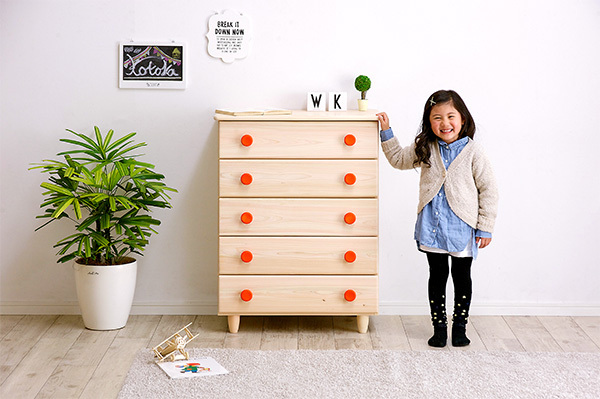 KOTOKA furniture is fashioned from solid Japanese cypress that is pleasant to the touch and produced in Kumamoto Prefecture, with bright colors adding an accent. 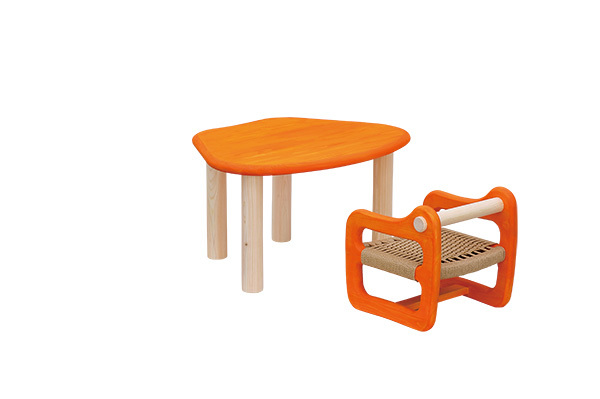 We have created a playful design, allowing children to spend moments filled with imagination. A lovingly handcrafted appearance. 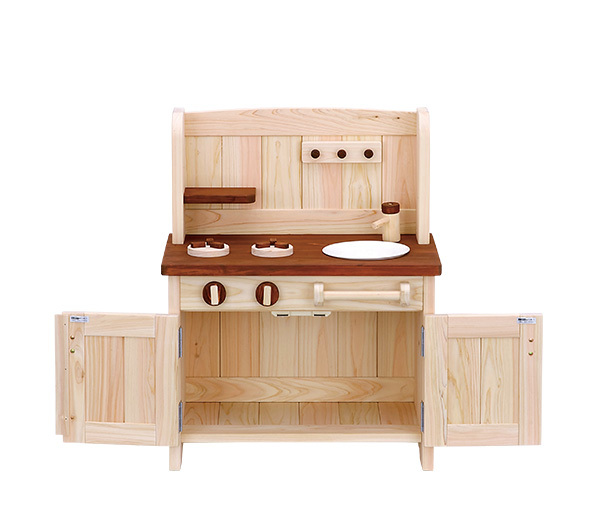 Conveying Okawa’s woodworking techniques and the appeal of Japanese cypress to the world. 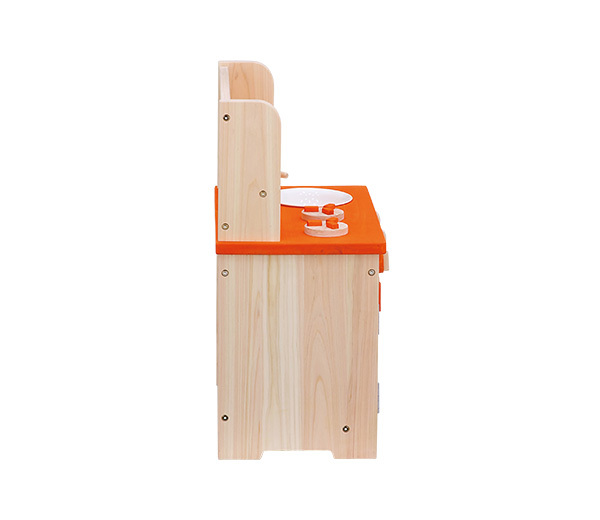 While examining the characteristics of Japanese cypress, we discovered some things that are ideal for a child’s health. 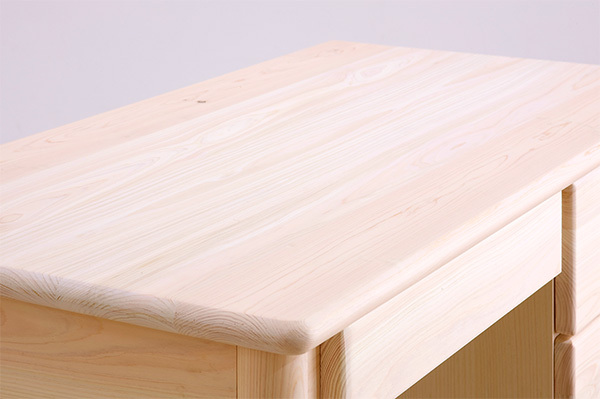 The phytoncides contained in Japanese cypress have excellent antibacterial properties and a relaxing effect, and its humidity-controlling effects inhibit the growth of mold. 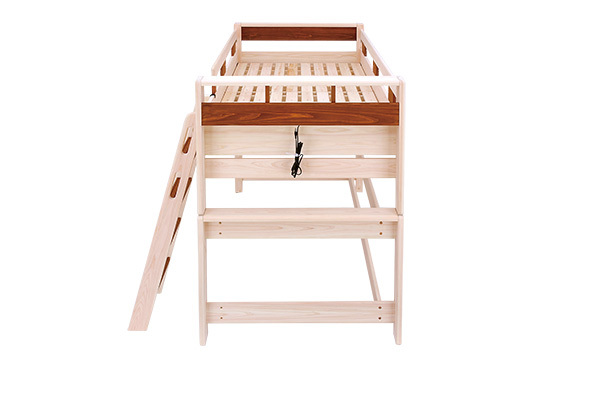 It is said that a well-slept child is a well-kept child, and the KOTOKA bunk bed provides an excellent sleeping environment for children who sleep long hours. 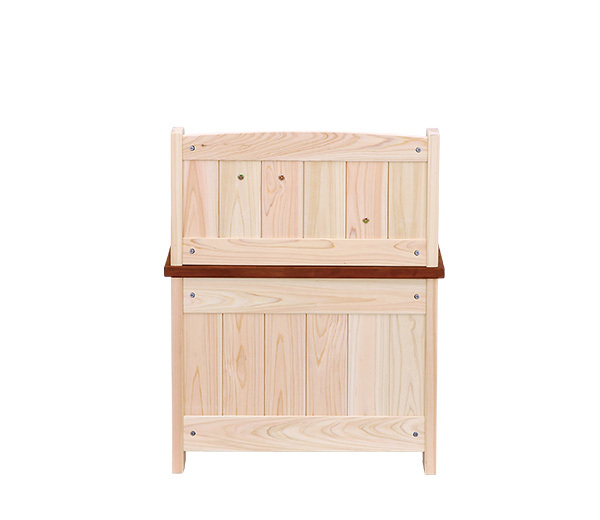 The craftsmanship of skilled artisans working at Okawa’s carpentry shops is essential in achieving the softness of the rounded finish common throughout the KOTOKA series – including the bunk bed, chest of drawers, and desk. Each piece is crafted while keeping in mind the faces of the children who will touch them over and over again with bare hands. Large amounts of VOCs (volatile organic compounds) are generally used in organic solvents for oil-based coatings. However, these are said to be harmful to the human body and are thought to be a cause of sick house syndrome. 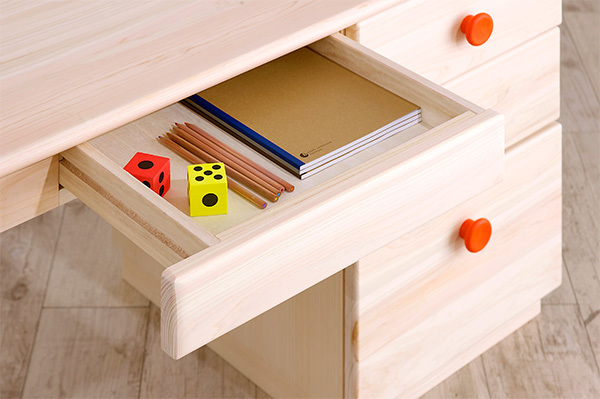 The water-based coating used on KOTOKA furniture contains no harmful substances that give off strong odors and damage health. 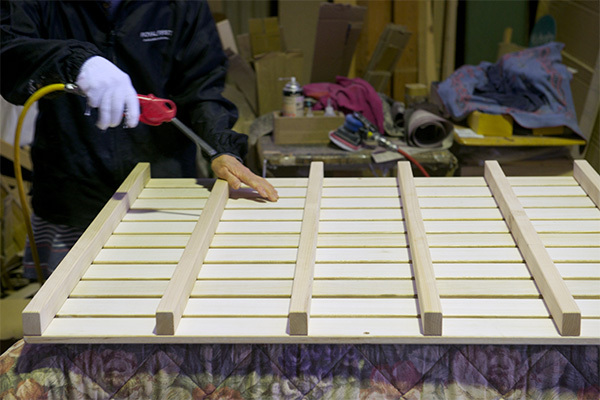 Oil-based coatings create a film on the surface, preventing the wood from being able to breath. This makes the wood feel cold in winter, when it should feel warm, and gives it a sticky feel in summer, when it should feel smooth. 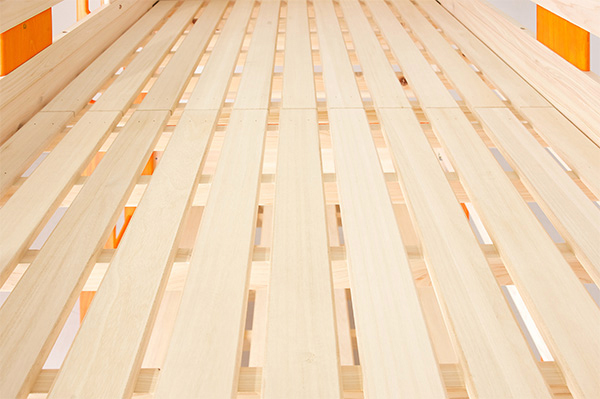 Wood is a material that breaths. It has a humidity-controlling effect, absorbing moisture in times of high humidity and emitting it in winter, when humidity is low. 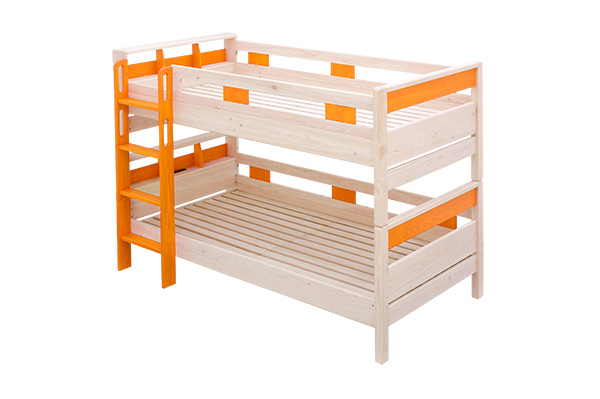 This makes it a wonderful material which provides a comfortable space. 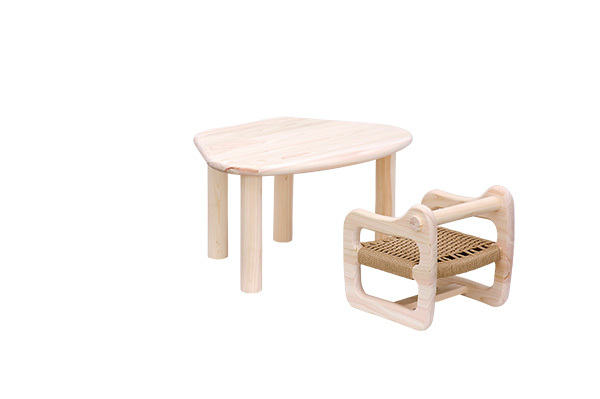 While the water-based coating allows the wood to breath, it also highly water repellent. 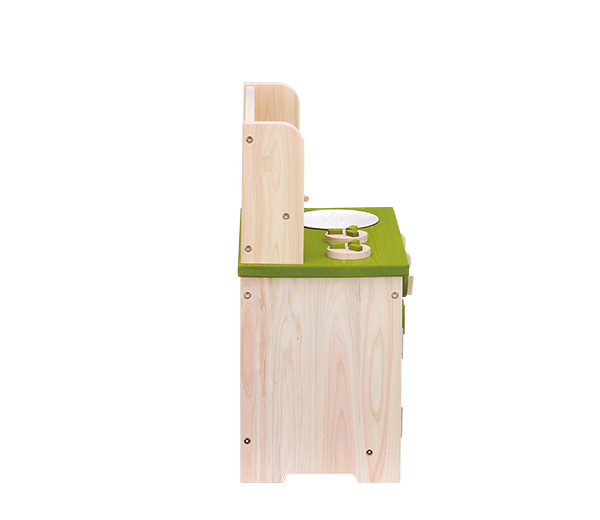 *The Kids Design Awards select products, spaces and services which excel in enabling children to live in safety, develop rich sensitivity and creativity, and which create a favorable society in which to raise children. 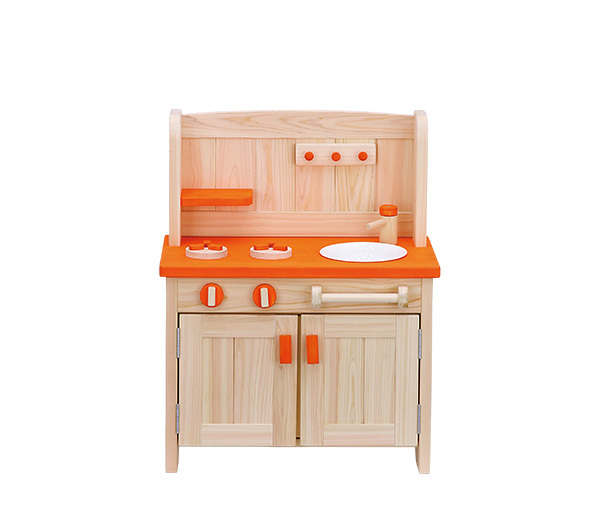 They aim to widely publicize these products, spaces and services to society. Any product, space or service that is concerned with children and child care is eligible for the award. 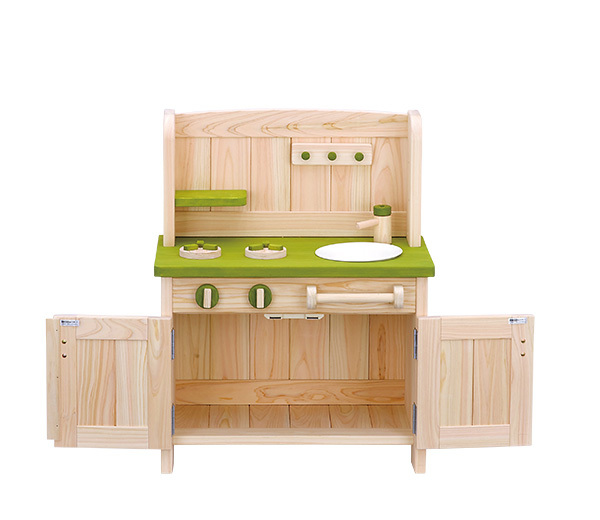 This naturally includes products for children, but also items developed for adults and the general public. The awards target a wide range of fields, from household goods to homes, urban development, workshops and investigative research. Award-winning products are permitted to use the Kids Design Mark. 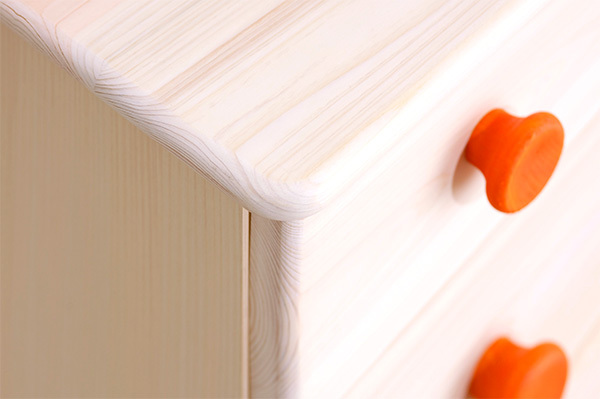 *The Japan Wood Design Awards is a new award system to recognize especially outstanding products or initiatives that rediscover the merits and value of wood, and are evaluated from the perspective of the consumer. 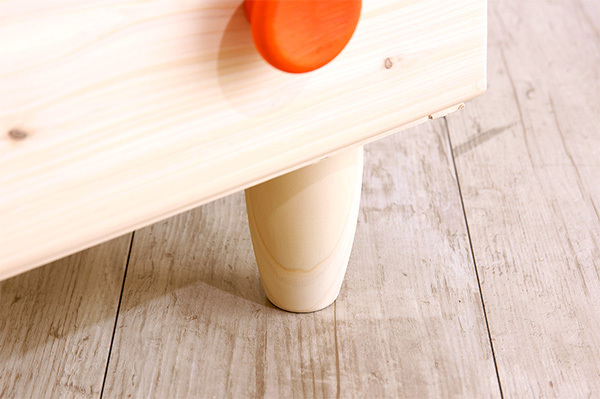 The award system aims to popularize and develop an “enriched life with wood” and promote the use of wood and the decoration of our daily lifestyles and society. 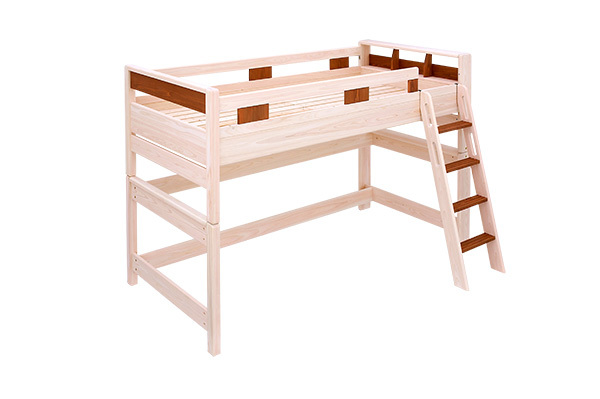 Loft beds are a huge favorite of children — they act as both bed and makeshift play space. 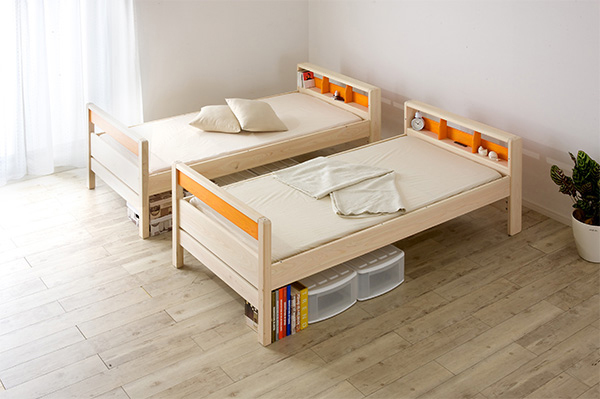 What was once a bed space can be converted into a storage area. 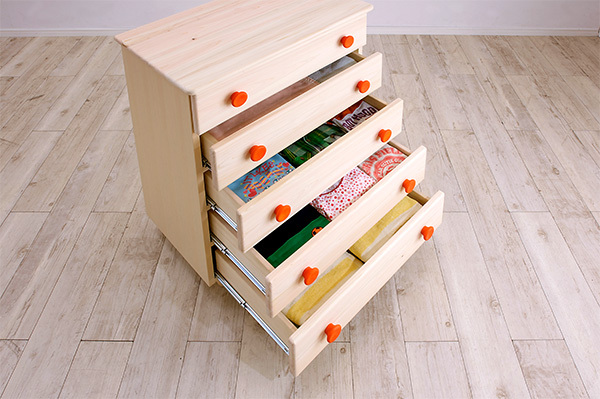 This means the item does not take up excess space in the room, keeping things neat and clean. 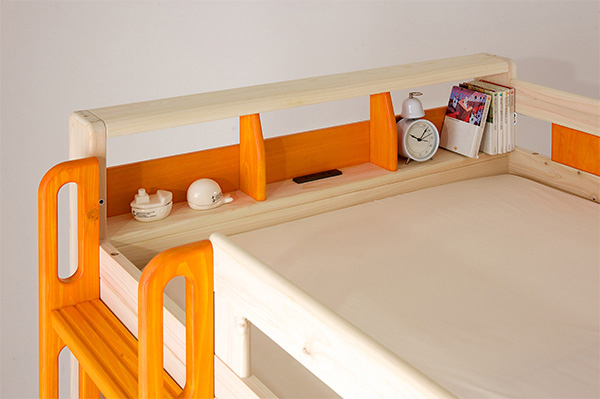 It can also be converted into a single bed which the child can use when older — an economical and ingenious design. 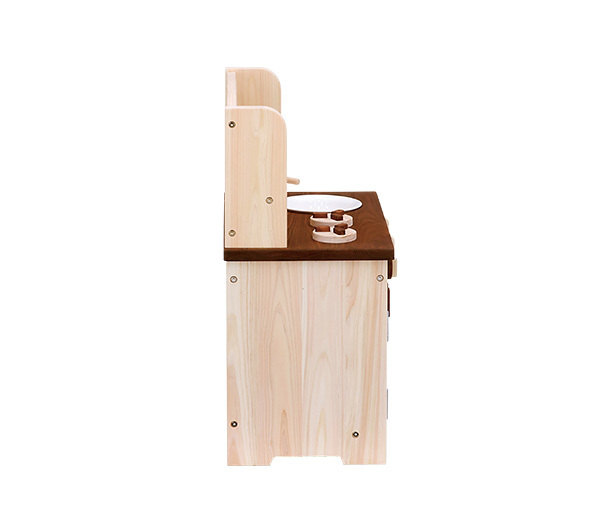 Sharp edges have been rounded and the item has been given a curved form for added safety and gentleness to the touch. 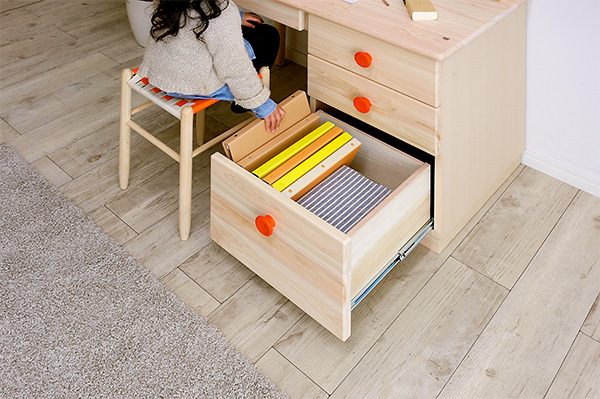 The desk is designed to be combined into new forms to promote communication. At both home and school, communicating with your child is essential to his or her growth. 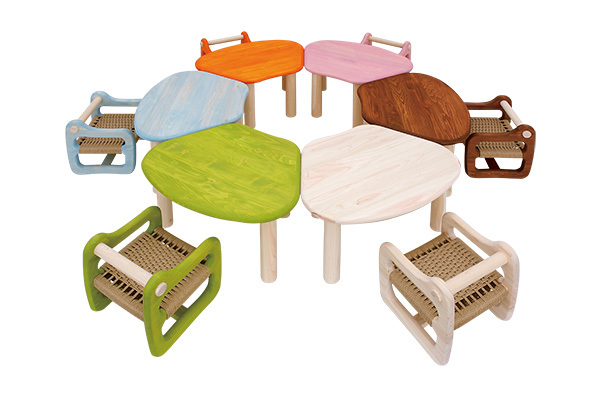 A circular shape can be created, or the layout can be spread out horizontally, with several people or even just a few seated. Further, the warm pastel colors lend a cute look to the room. 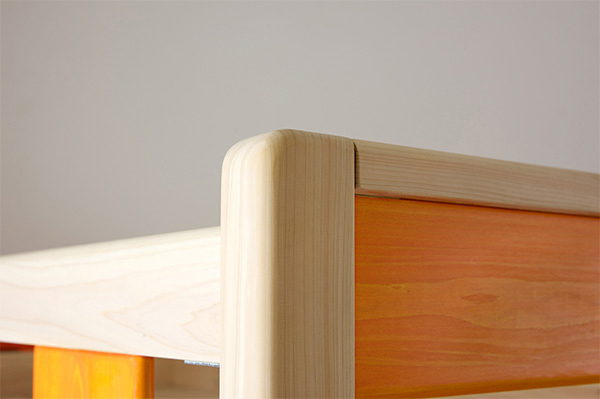 Sharp edges have been rounded and the item has been given a curved form for added safety and gentleness to the touch. Children first learn to play by imitating their mothers. 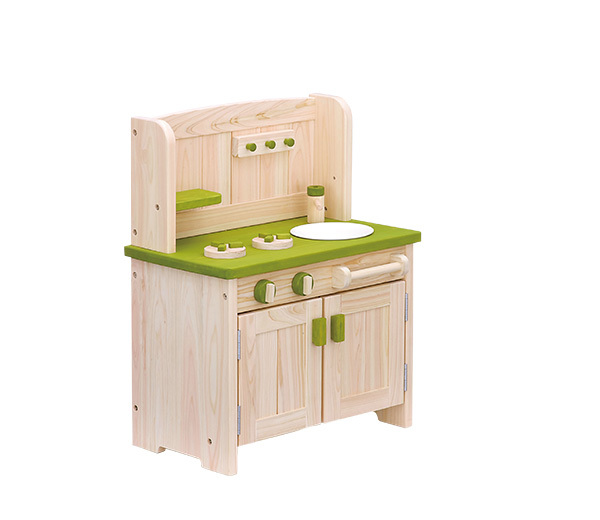 The basics of early play involve stacking plates on a shelf, ordering pots and pans, washing dishes, et cetera. By learning from the actions of their mothers, children’s play expands in unlimited and creative ways. Using the hands to play positively stimulates the brain. In addition, children learn the basics of cleanup as they play. 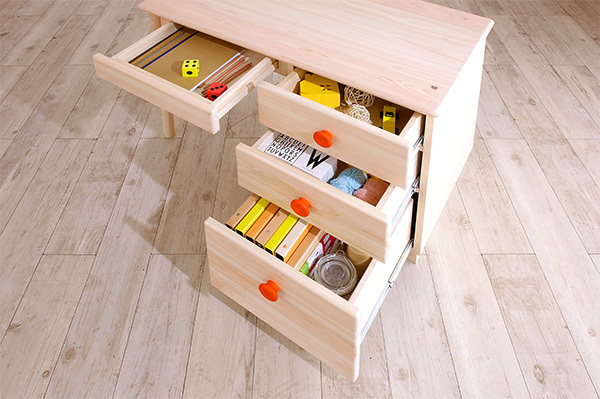 When not in use, the item can be used to store toys and function as a useful piece of furniture. 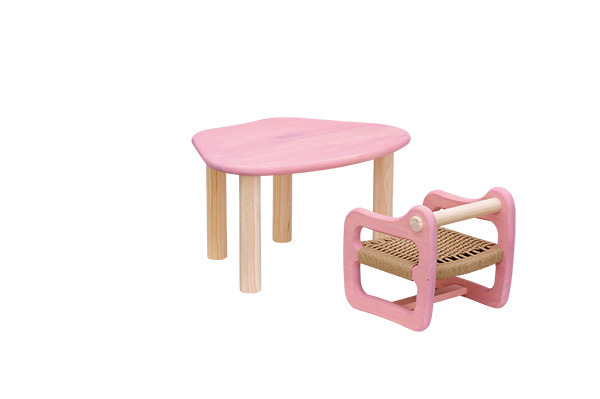 Once the child grows older and stops playing, the item remains as a decorative accent. 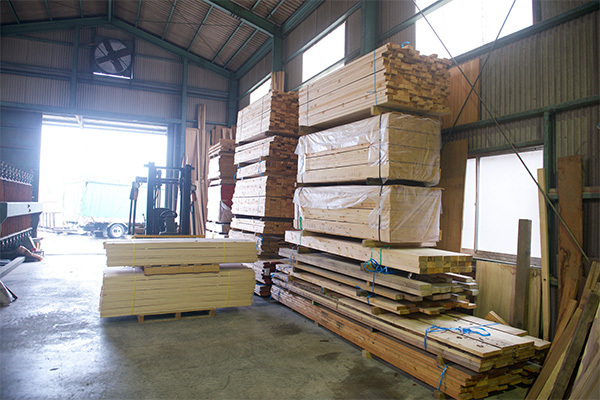 From our desire to convey the goodness of Japanese hinoki cypress to people overseas, our company makes concerted efforts to proactively develop awareness of hinoki wood and the KOTOKA series abroad. 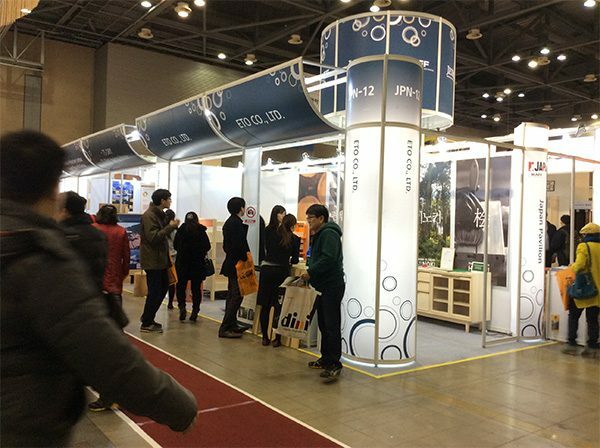 Exhibited in the Japan Pavilion at the Kyunghyang Housing Fair, Korea’s largest construction material trade fair, held in the city of Goyang. 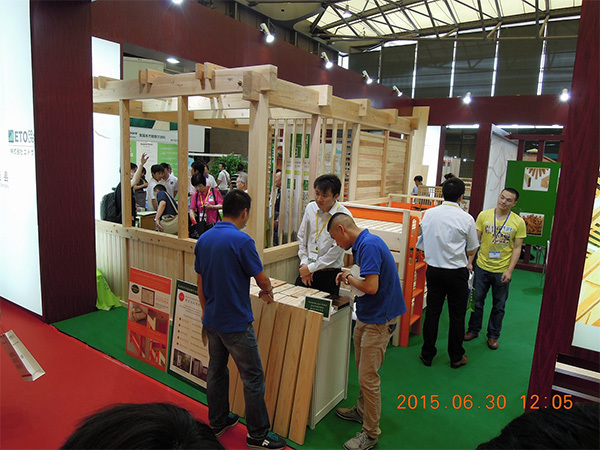 Exhibited in the Japan Pavilion at the Shanghai Construction Material Exhibition, China’s international construction material industry exhibition, held in Shanghai. 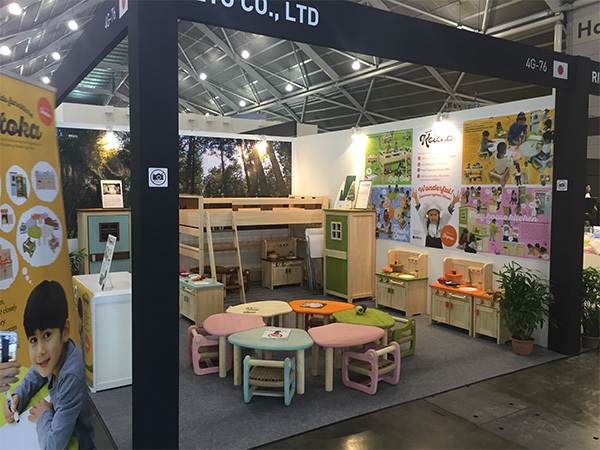 Exhibited at IFFS 2016, the international furniture trade fair held in Singapore. 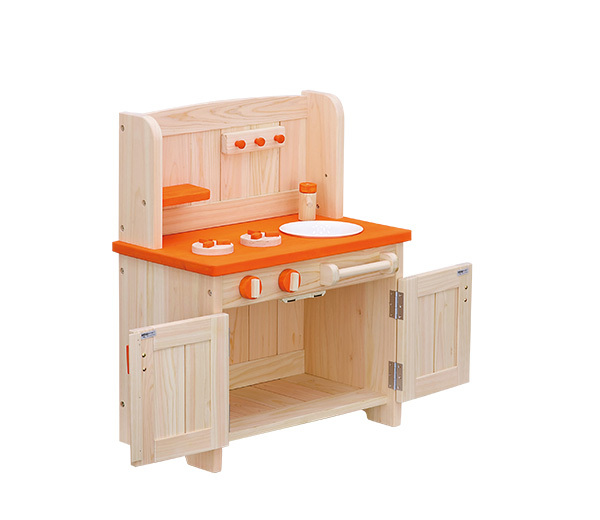 We take high-grade cypress with few knots and further sort it, using only the highest quality hinoki cypress. 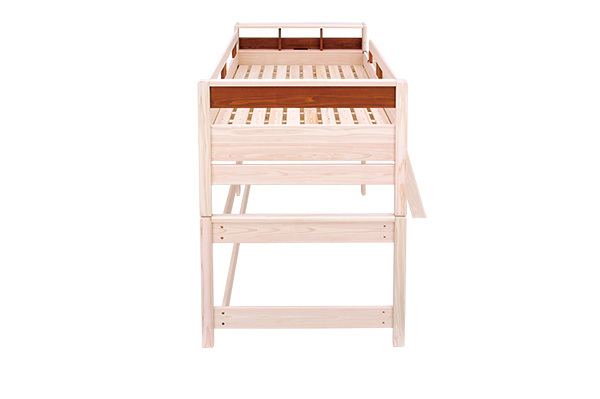 Hinoki cypress has astonishing properties that help to create a luxury sleeping space. – The aroma can help to alleviate sleep disorders. – Cypress prevents mould and wards off mites. It is also antibacterial. 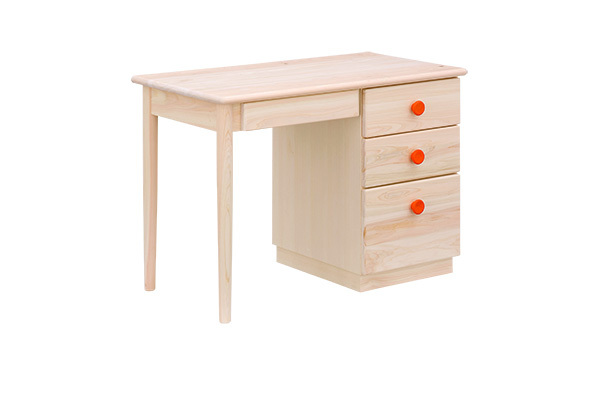 – As a construction material, it offers world-class durability. 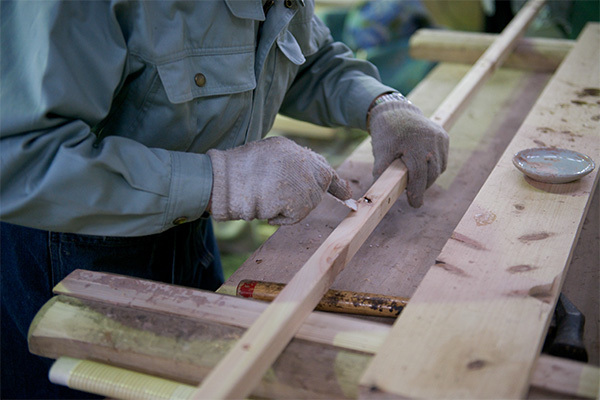 Our skilled craftsmen build our furniture carefully, checking everything by hand at every stage of production. 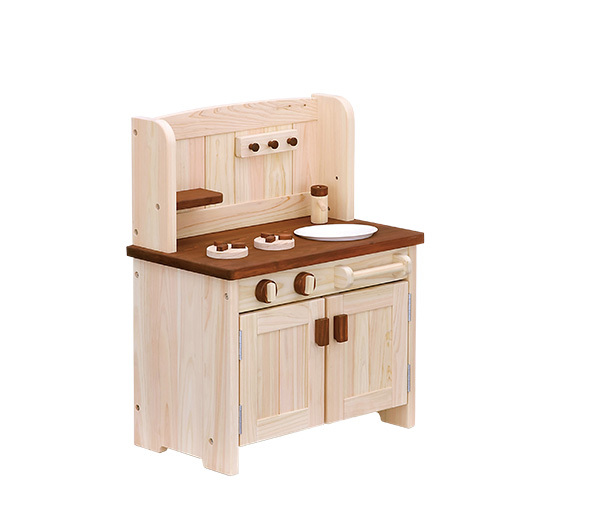 The city of Okawa in Fukuoka prefecture has been renowned as Japan’s top furniture-making town for over 480 years, and the craftsmen from there create wonderful objects for us with proficient skill, judging the character of the hinoki cypress as they go. Copyright c ETO CO.,LTD. 2017 All right reserved.